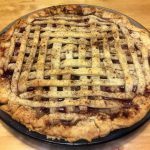 This vegan, environmentally-friendly cherry pie is beautiful, decadent, and surprisingly easy to prepare. It is comfort food for my husband and his siblings as their beloved mother Mary Lee Reynolds made it frequently. 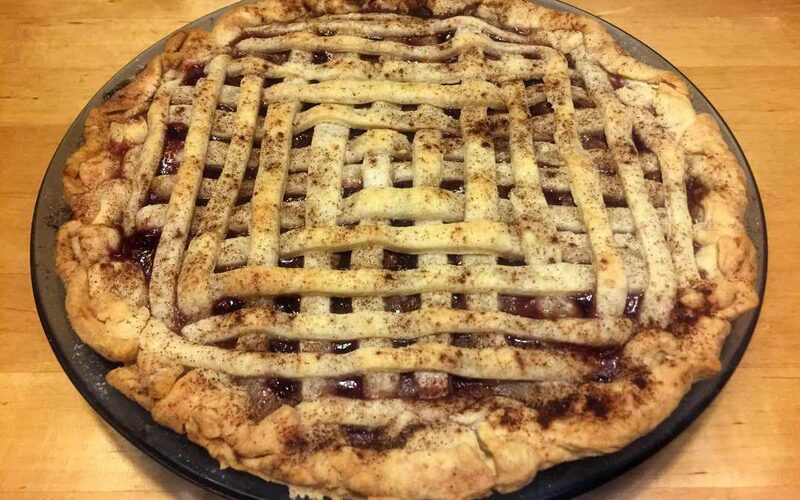 Of course, fruit pies are most environmentally-friendly when made with fresh, seasonal fruit. However, this recipe is nice to have on hand. 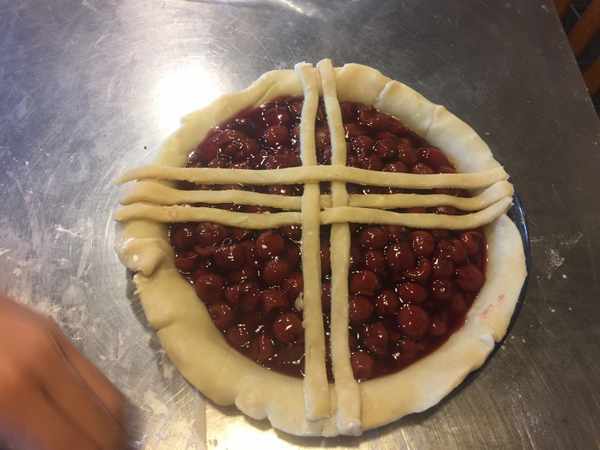 It uses only ingredients that you can keep in the pantry for when you need a gorgeous, delicious dessert for a special occasion that can be made pretty quickly. 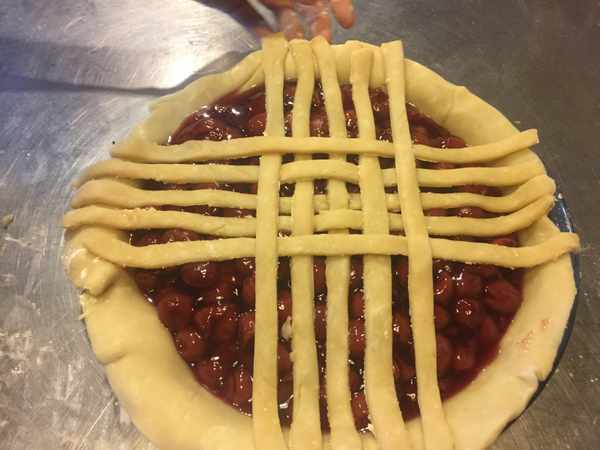 And, you can always use a filling made from fresh fruit and follow the lattice direction here. This pie is beautiful, decadent, and surprisingly easy to prepare. Whisk in the corn starch, sugar, salt and cinnamon. Heat, stirring constantly, until the mixture boils and thickens. 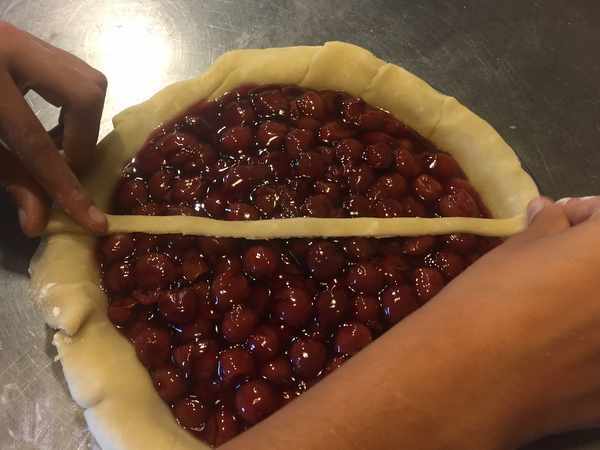 Add the almond extract and cherries. Cut the top crust into strips. 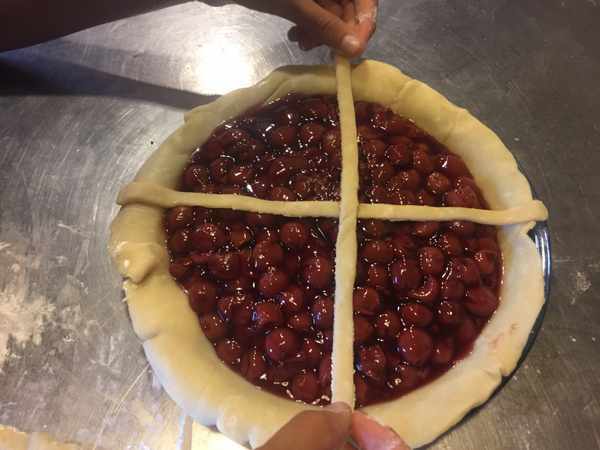 Choose a strip from the center (a longer one) and lay it along the center of the pie. 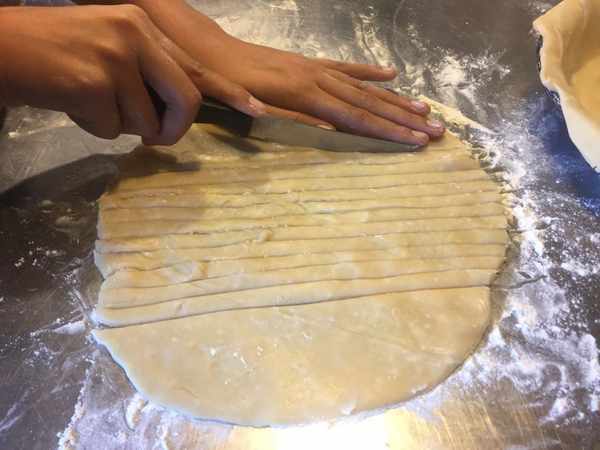 Choose another long strip and lay it on the pie perpendicular to the first one you added. Choose another long strip and lay it to the side of the first one you put down. The fourth strip will go to the side of the second strip. This time, lay the strip parallel to the first one you put down, but on the opposite side from the third strip added (you alternate sides each time you add a strip in each direction). 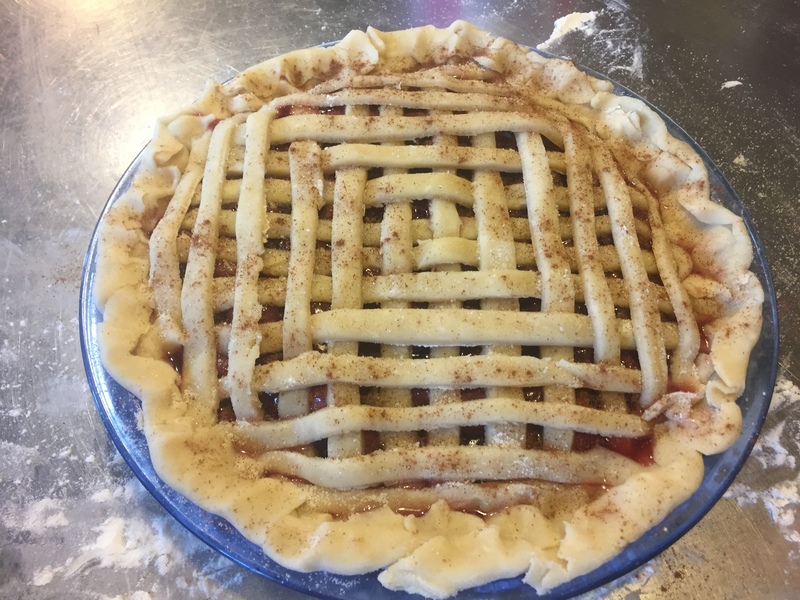 Continue laying strips in alternate orientations, adding to different sides of the pie in turn. 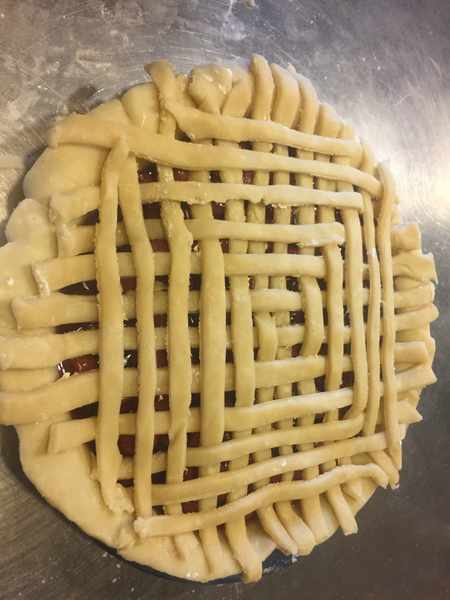 Here is the finished lattice, before crimping. 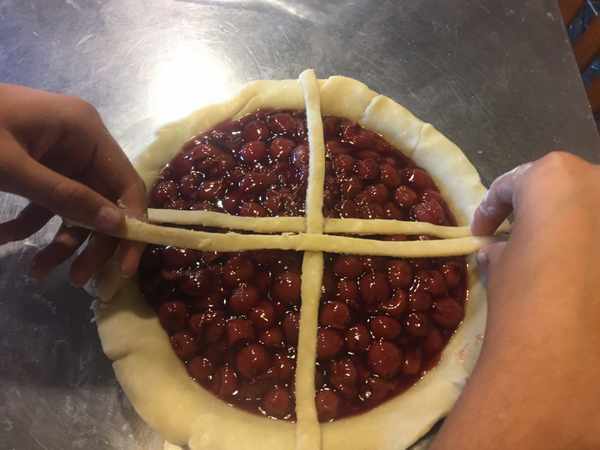 Pinch around the edges of the pie, and sprinkle the top with sugar and cinnamon. Bake for 15 minutes, then turn the heat down to 350 degrees F. Bake for another 20-25 minutes. 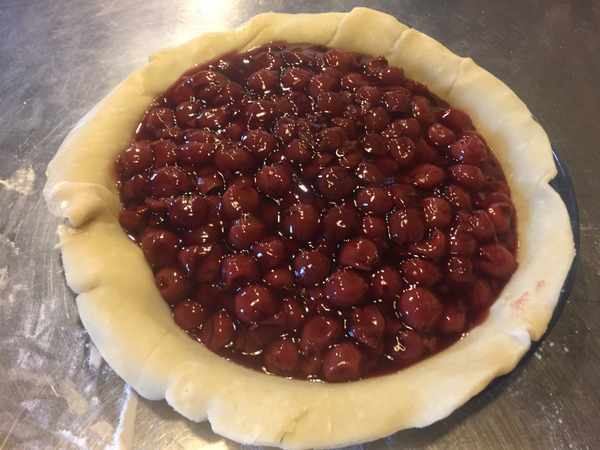 No-stovetop cook version: For a less syrupy pie, just take 5 cups of drained cherries (or fresh cherries or other fruits), and toss them with cornstarch, sugar, salt, cinnamon and extract. 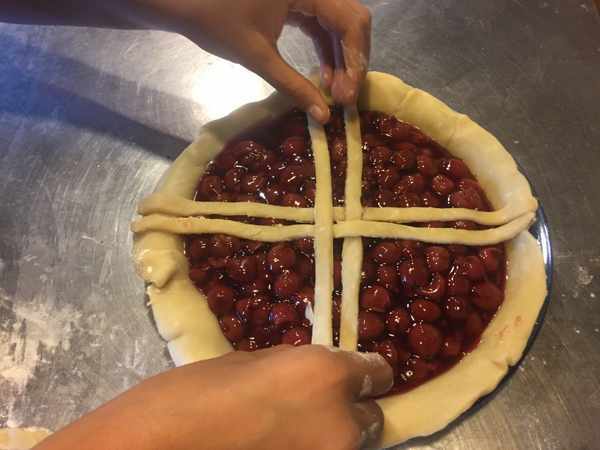 Pour that into the crust and get straight to work on your lattice. No stove top cooking required! In general, the numbers show that in any recipe you can really lower your carbon footprint by switching out dairy butter for a vegan butter. Butter has a footprint of 11.92 gram CO2-eq per gram while vegan butter has a footprint of 1.36 grams CO2-eq per gram. Conventional butter has a high carbon footprint because the natural metabolism of cows results in production of methane, a potent greenhouse gas. 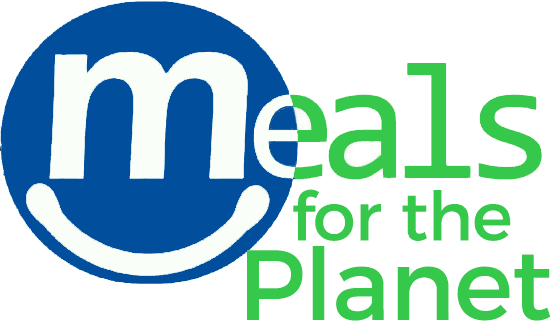 In addition, dairy cows require feed crops, which in turn require fossil fuels for fertilization, production, and transport. Finally, cow manure emits methane and nitrous oxide—both greenhouses gases! Using vegan butter for the 1/2 cup called for in one bottom crust saves 1,183 g CO2-eq, or the amount of CO2-eq emitted in a 5.3 mile drive. This reduction constitutes 32% of the amount each person would need to save each day to reach the Paris Climate Accord targets. See Taking Climate into our Own Hands and Low Hanging Fruit for a Low Carbon Life for more information on a per capita Paris Climate Accord target. For other great holiday dessert, check out Pumpkin Pie for the Planet and Apple Crisp for the Planet. Delicious and educational! what more could you ask for?